Travel easy. Photo by Jeralyn Gerba. 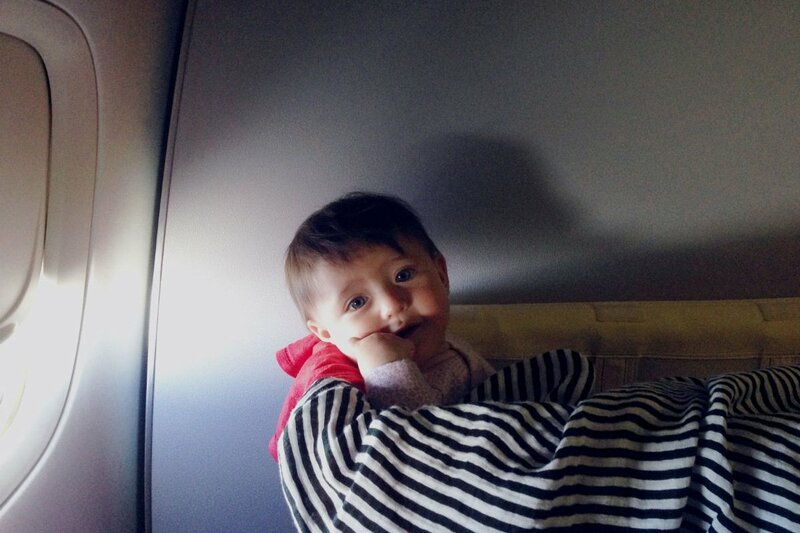 Just in time for your holiday long-haul: Fathom co-founder and traveling parent Jeralyn Gerba discusses how to manage flying with a toddler. Gone are the long-haul flight routines that involve a lot of sleep and uninterrupted movie-watching: I have a two-year-old. But now that we have several good airplane rides under our belts, I have a few good tips to spare. This holiday season, traveling with the family will be just fine — just keep your head on your shoulders and these five tips in your back pocket, and you'll come out relatively unscathed. Editor's note: This video originally aired on Facebook Live, but the connection cut out before tip #5 was revealed. 1. Let them in on the plan. Kids — even laid-back kids — get a little rustled when their routine suddenly changes. Depending on your child's age, you'll have to figure out the right way to communicate, explain, and remind the babe where you are going, what you are doing, and why. Share your plans and a map, tell them what to expect on the plane ride. Repeat this regularly leading up to the trip and make the journey sound fun (not scary or stressful). Something like, "Guess what? In a few days, we’re going to Grandma’s house in California. We’re going to take a long flight and you’re going to have your own seat and snacks and toys. When you look out the window, we'll be up in the clouds. It’s going to be so cool." Repeatedly laying out the plan is a good prepping tool for the littles and a good mantra for you. Let it manifest! 2. Pack like a boss. Not too much, not too little. Just a spare set of clothes, extra diapers, portioned snacks, toys, and a favorite blanket. Call your hotel ahead of time to ask about a crib or pack-n-play so that you don’t have to lug your own. If you are visiting family, see if they can ask neighbors or friends about borrowing car seats, high chairs, or cribs. You’d be amazed how much grownups (especially grandparents) want to feel useful and contribute to the cause. Of course you can do it all yourself, but why should you? It’s the holidays — the perfect time for everyone to chip in. 3. Use your parent card. Be smart about utilizing your parent-traveling-with-kid status at the airport. It’s the one time in your life when the outdated bureaucracy works in your favor. Look for a sympathetic TSA employee to move you, your kid, and your stuff, through the security line quickly. Absolutely take advantage of pre-boarding — it's the best. Check strollers and car seats at the gate. They’ll even check your luggage there. Think compact sizes: The car seat I like traveling with is called the Immi. It's the only one I've found to be quick and easy to set up and break down (it’s used in all Ubers). 4. Reveal your secrets slowly. Have a stash of portable, fun, edible surprises — stickers, coloring books and crayons, tiny dinosaurs, videos on the iPad, Silly Putty, granola bars. No kazoos or things that make annoying sounds. 5. Don’t be a stickler for a routine. We don’t have a TV at home, but on a plane, where there are TVs as far as the eye can see, there’s no use in tormenting my child or myself. It’s a treat. I’m letting her watch a movie. Play the long game. What's going to keep everyone sane? Try to think about meltdown scenarios ahead of time so that you can avoid them when possible. Things fall apart when people are hungry, fatigued, and feel like they’re being forced to do things. I’ve seen this happen firsthand with adults in transit, so you can’t really hold it against the kids. If you give them a bit of latitude, let them run out some energy when possible, and feed them well, you’ll make it out of there alive. You may even enjoy yourself.